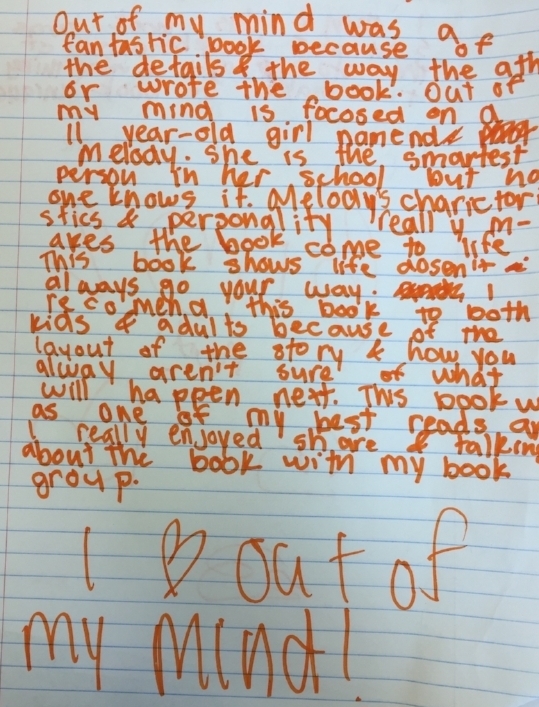 Student book review for Out of My Mind by Sharon Draper after our book clubs wrapped up. It’s so close to the end of the year (and summer!) that we have started getting questions about summer work and summer reading. We absolutely want to encourage students to read over the summer in order to maintain their good reading habits (which are important life skills) and avoid the dreaded summer slide. In our class (and at our school), we’ve found our students tend to have consistent access to books and reading options all summer, so for the population we work with, the most important way to encourage summer reading is to promote reading all year long! All year, we have read alouds in our 3rd grade class. While we know this takes up a lot of instructional time, we have found that reading chapter books out loud to our 3rd graders has improved their comprehension, fluency, vocabulary, and engagement as readers (and more!). They have developed (or maintained) an incredibly high level of appreciation for wonderful books, reading, read alouds, authors, sequels, new vocabulary, cliffhangers, and more! Apart from read alouds, we also encourage solid independent reading habits. We gave up on reading logs early this year as they felt like a drag and a chore and instead added a section on homework grids (they receive a new one every week with homework choices that are due Friday) that says, “What is one book you enjoyed this week?” Some students write as many as three or four books they enjoyed that week, and some add comments about the books too! We also have students share out periodically about books they are enjoying and encourage them to recommend books to each other. This genuine sharing of books and authentic pleasure in reading is gold. Another amazing tool to prep students to be readers all summer long (and beyond) are book clubs! We are just wrapping up a book clubs unit that has been so powerful. Again, talking to each other about books you enjoy is a life skill and a genuine, authentic way to communicate about books. We also tried to tap into books that were the first in a series so some of our more reluctant readers would be really into the first book because they read it with their book club, and now have many more books with the same beloved characters to read all summer. Finally, (and we can’t emphasize this enough), encourage library use! We are so lucky to be in DC where we have an amazing public library system that runs a phenomenal summer reading program for kids. However, just reminding students that libraries exist is important. For all of our research projects this year, we’ve brought in books from the DC public library (and reminded our students to take extra good care of them since they are “our personal library books.”) Modeling library use (and of course, active reading as adults/teachers) can motivate students to use the public library themselves (and of course, provide them with books all summer). Librarians are our priceless and valuable partners in our quest to get kids reading. If your students may not have consistent access to books this summer, ask a librarian for help! Depending on your flexibility with taking students out of the building or inviting people in as guest speakers, there are multiple ways to set students up to be public library users. A student's summer reading goals: "read as many books as possible!" We don’t assign a list of required reading over the summer (and are fortunate to have this flexibility at our school), but we do have students set summer reading goals and create lists of books they might like to read over the summer (and we share our own). This “Summer Reading Bingo” from the Curriculum Corner looks fun. How does summer reading work in your classroom (or school or household)? We’d love to hear more ideas!